The first-ever Town Jazz event with Marshall Hawkins, a bassist who has played with the likes of Miles Davis, attracted about 250 attendees on Saturday night in Idyllwild, in spite of torrential rains and hail that dumped on the small mountain town hours before the event. “It cooled things down, and we might get more people that we expect,” said Doug Yagaloff, from Mountain Harvest Market, one of the sponsors of the event. He said the Idyllwild Round Table rented 500 chairs, just in case. Tom and Karen Barnes from Arizona were walking around Idyllwild, and stopped at The Spruce Moose. 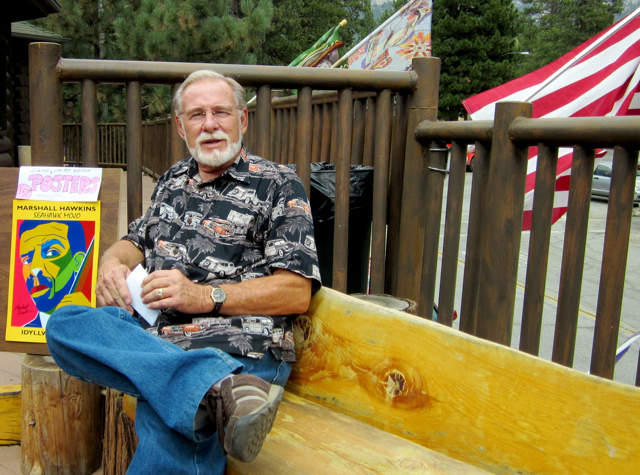 A retired businessman and sax player, Tom came for the 18th Annual Jazz in the Pines event at Idyllwild Arts, but was also interested in learning more about Town Jazz. He thought the $10 ticket price was a good deal. Although Saturday night was cool, and the stars were out, the jazz was hot. You could hear it from the streets. Two friends of Marshall Hawkins’ came from Vista to support the event. One, a cellist who has played with Marshall onstage at Jazz in the Pines before, said that Town Jazz was a more intimate venue. 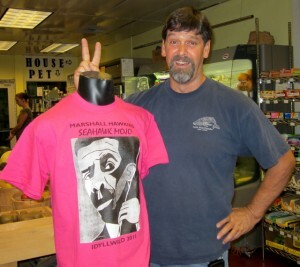 Kevin poses with Town Jazz T-shirts with Marshall Hawkins image, are available for $15 each. Jeffrey Taylor, who owns Green Cafe internet, agreed that Town Jazz was more intimate. 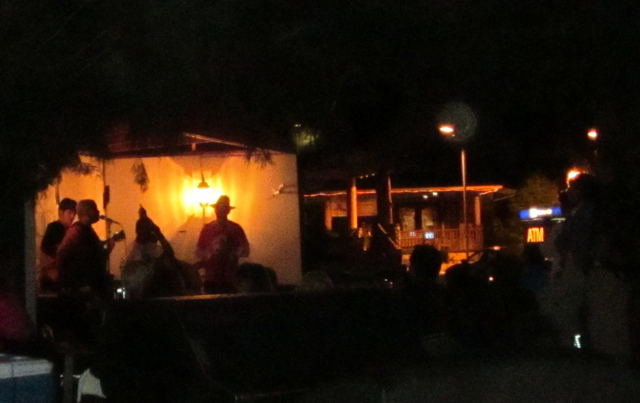 “You can’t beat jazz at night under the stars,” he said. Jessica Schiffman, a local book illustrator and volunteer for the evening, sat close to the stage and was impressed with the music. “You can hear them performing their art, and you’re right there experiencing it with them,” she said. She planned on volunteering the second night of Town Jazz, which will be held outside Jo’An’s on Sunday, August 28 from 5 p.m. to 8 p.m.
Tonight’s special guests for Town Jazz honoring Daniel Jackson include Yve Evans, and Roland Esquire Holmes. Musicians include: Gilbert Castellanos on trumpet, Bob Boss on guitar, Brett Sanders on drums, Mikan Zlatkovich on piano, Najite, African percussion, and Daniel Jackson on tenor and sax. Marshall Hawkins played his bass last night with the groupand will play again tonight. After the last set Saturday night, Marshall thanked the musicians and the crowd for coming. Tickets for tonight’s performance are $10 each and can be purchased at Mountain Harvest Market, The Spruce Moose and at the door. 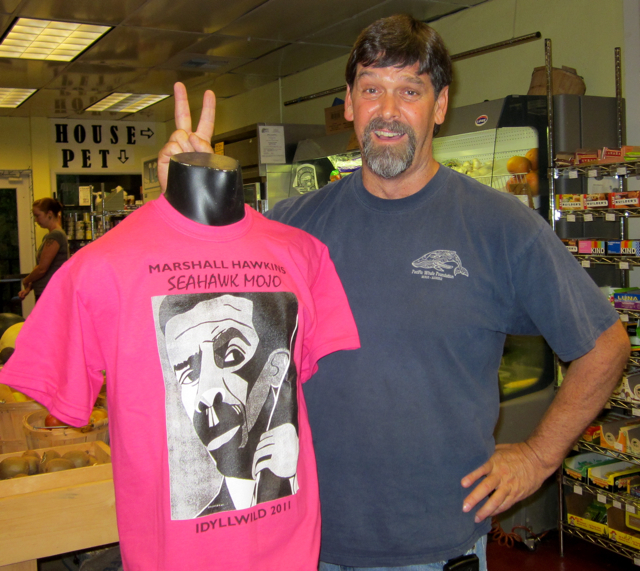 Marshall Hawkins T-shirts are $15 each and full-color event posters are $5. All proceeds go to benefit Marshall’s charity for jazz in the elementary schools, Seacrest Mojo. For more information on Marshall Hawkins’ Town Jazz event, visit www.greencafe.com.